These three flossies must have been related to Job Lot (I stand anonymously corrected – check the comments). His wife, as you might recall, was instructed not to turn around and look at the shop windows as she left what ever town she’d put on her credit card. Well, of course she couldn’t resist and ended up as a pillar of salt. I think that’s how the story goes, anyway. A similar fate appears to have encountered these three (ex-students of the Maria Ward school?). 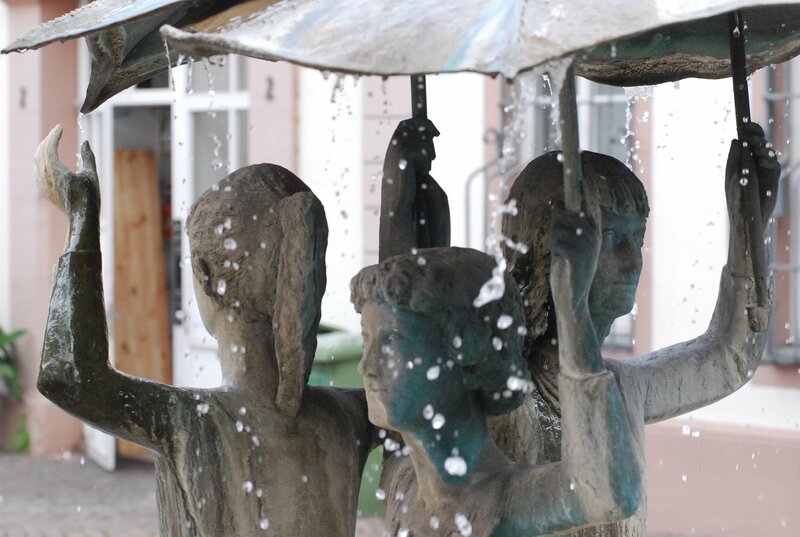 And there they stand, fountainised, right outside the entrance to their school, with water gushing off their opened brollies. 04 Sep	This entry was published on 4 September, 2007 at 06:44. It’s filed under Mainz and tagged fountain, maria ward, Määnzer Mädcher. Bookmark the permalink. Follow any comments here with the RSS feed for this post. >I have heard that some parents want their daughters to turn into a pillar of salt for misbehaving. I had not thought of bronze before.